Three recent Criterion Blu-ray releases—two new to the label, one reissue—focus on female protagonists on the cusp of change. For one, a mature woman of some importance, this change shakes her most fundamental beliefs, allowing her a brief moment of happiness before ending with a gradual descent into madness. For another, it is the beginning of an attunement to her spiritual life, and her connection to another woman hundreds of miles away. And for the youngest woman, trying to make the best out of her dismal surroundings, any change can only be a positive one. It is with her that we begin, and her name is Mia. Fish Tank (2009) follows 15-year-old Mia (Katie Jarvis) through her day-to-day existence in the housing projects of Essex. As with many girls her age, she is dealing with her emerging sexuality, the eroding relationship between her young, competitive mother, Joanne (Kierston Wareing), and a growing realization that her sad environment is not expansive enough to hold all of her ambitions. At this crucial moment comes a dangerously handsome boyfriend of mum's, Connor (Michael Fassbender), a dangerously questionable catalyst in Mia's coming of age. Andrea Arnold directs the film from the inside, giving us Mia's perspective as if she were the metaphorical fish trapped in the tank looking out at the big, wide world inaccessible to her (Jarvis is in every scene). It is a nice change from other realist films which futilely try to impart insight about their subject with an impartial eye, as if one were viewing microbes in a petri dish. No, Arnold's camera is tied to Jarvis' movements throughout her limiting neighborhood, wisely forgoing the cliche, desaturated aesthetic one usually gets in these types of films. Mia's world is bright enough, and comfortable enough to dissuade the teen from escaping, at least initially. The introduction of Connor complicates things. The alluring man appeals to Mia on two levels, as father figure and object of desire. Making matters worse is the dawning sense that the mysterious Connor has a secret life he is avoiding, one which prods him to come to Mia's immature mum for a level of affection she is incapable of offering. It's a setup rife with pitfalls for the appealing Connor, as well as the vulnerable Mia, leading to a collision between the two that, though unsavory, is handled quite sensitively by Arnold. Hundreds of miles away, in Krakow, Weronika (Irène Jacob) sings outside with her choir, so lost in her beautiful vocalization that when it begins to rain she continues to hold her high note longer and more forcefully than the rest of the group who run for cover. Weronika's performance is heartfelt, and as we soon discover, heart-hazardous. Whether aware of it or not, Weronika's heart is perilously close to giving out with the next sustained note she sings. 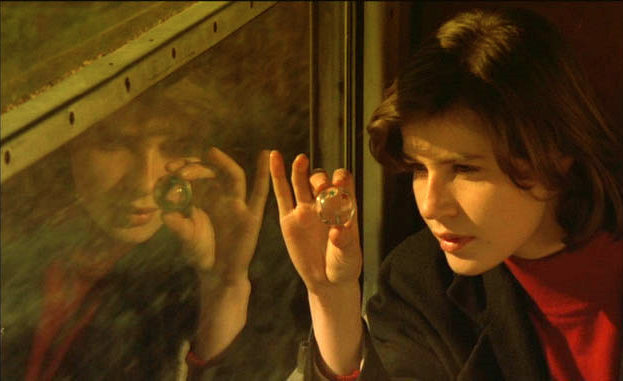 And about 20 minutes into Krzysztof Kieslowski's La double vie de Véronique (The Double Life of Veronique) (1991), it finally does; Weronika dies. In France, her doppelganger Veronique (also Jacob) senses Weronika's death, a feeling of loss which suffuses her entire being. It prompts the young music teacher to instinctively see a cardiologist, and eventually, quit her own singing lessons. More happens of course, but it is best to leave it unsaid here, for fear that this delicate tapestry unravels.The sensation I would most associate with viewing Véronique is one of floating. Kieslowski's gossamer film is one made up of tiny, indelible moments suspended in the firmament: a look at the world askew through a small crystal ball; sunlight reflected on the face of Veronique by a child in an apartment across the way; the dance of a marionette as it, too, expires. Véronique blissfully carries the viewer into the awakening spiritual life of its young heroine as she moves from being self-centered to centered-on-the-self—and its relation to both the physical and metaphysical world around it. As ethereal as Véronique is, Senso (1954) is large and sweeping. Two-thirds of the way through Luchino Visconti's period drama, the Italian countess Livia (Alida Valli) trysts with her lover, Franz (Farley Granger), one of the occupying Austrian soldiers who her countrymen have begun to rebel against at the outset of Il Risorgimento, the 19th century war of Italian unification. Franz has deserted his post to visit the married grande dame at her country estate after weeks of ignoring her romantic entreaties, and the viewer is well aware that he, a rumored womanizer, is up to something. But Livia, trapped in a loveless marriage to an older Austrian sympathizer, is so overwhelmed with emotion at the sight of the beautiful Franz she ignores the telltale signs of his infidelity, exploitation... maybe even repressed homosexuality. The patriotic Livia has been entrusted by her cousin Roberto (Massimo Girotti), a resistance leader, with a considerable amount of money reserved for their cause. When the manipulative Franz threatens to leave Livia to join the fight, she screams, "Wait!" The music of Anton Bruckner hits a crescendo as she runs away from the frame toward her bedroom door. She opens it, looks both ways into her hallway to make certain no one is watching, then runs across to another door, perfectly framed within the first one. The action is repeated twice more, as Livia runs deeper into the film frame, each door nesting within the other one like a matryoshka. Franz runs after Livia, finding her as she digs into the box of gold coins she was protecting for Roberto, her desperation spilling some onto the floor as Franz claws at each one now laying on the rug. This key scene embodies all that is best about Senso, one of my new all-time favorite movies. Valli's superb expressions, her limpid eyes frequently the size of saucers, her mannered stances and gestures, all seem staged as if for an opera. Her tone is appropriate given Visconti's affirmation of the film's melodrama in his decision to open the film with a performance of Il Trovatore in Venice's famed opera house, La Fenice. And Granger, so stoic and handsome in his white military tunic when he sweeps Valli's Livia away at the start of the film, has now fallen apart into a sniveling foppish mess sprawled across the lap of his lover like a boy on his mother's bosom. His feminine lips sneer in self-loathing as he blackmails her for money in return for a brief moment of affection. The well-appointed rooms in which the adulterers hide are embroidered with all manner of lavish finery, elaborate veils behind which Livia can hide that are quickly torn away by Franz, as she spirals downward into his machinations. And as Livia betrays her cousin—and nascent country—for a cowardly lover, the operatic music of her fellow Italian, Verdi, gives way to that of Bruckner, an Austrian just like Franz. 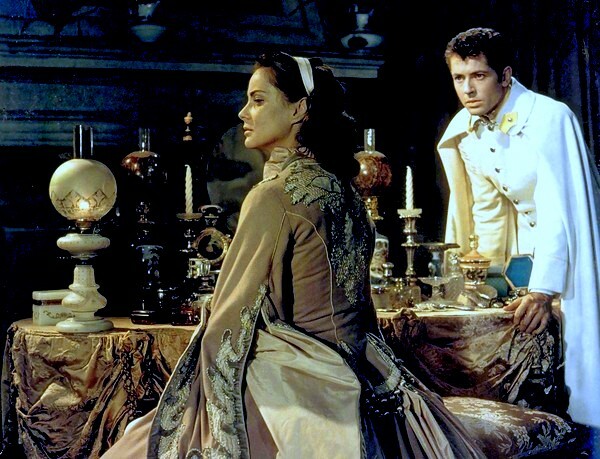 The lush romanticism of Senso, Visconti's first film shot in color, shocked his Neo-realist brethren who believed the director had turned his back on their fledgling aesthetic movement. But as any aficionado of the medium knows, the heightened theatricality of an opera often arrives at a greater truth by masking its thematic concerns in allusions and allegory. Here, Visconti wraps up his own contradictory feelings on communism, the fading aristocracy, and Italy's Fascist participation and occupation during the second World War—then still very recent—into one rapturous work of art. The strength of Visconti's influence on director Francis Coppola's work—Visconti's The Leopard (1963) is somewhat of a precursor to Coppola's Godfather films—becomes even more apparent in Senso. Visconti's use of opera as both metaphor and specific venue for development of intrigue in Senso's opening scene finds kinship in Coppola's The Godfather: Part III (1990), where the film's growing pileup of subplots culminates in a memorable performance of Cavalleria Rusticana that mirrors the events of the movie that have preceded it. Criterion's Blu-ray is a wonderful disc to lose oneself in, containing an English dubbed version (Valli and Granger shot their scenes in English) which has not undergone the same restoration as the original Italian edition. Titled The Wanton Countess, it suffers from the fact that nearly 30 minutes have been excised. But it benefits from having its dialogue translation written by Tennessee Williams and Paul Bowles, two men whose own ambiguous sexuality works in concert with Senso's bisexual actor and director to subtly inform the complicated motivations of the possibly closeted Franz. Whichever version you prefer, Livia's final scene—where she roams the streets of Verona, crying Franz's name in mad anguish—is equally devastating.